Honey-Teriyaki Salmon with an Asian honey glaze is such and easy, flavorful dish you can make any night of the week. 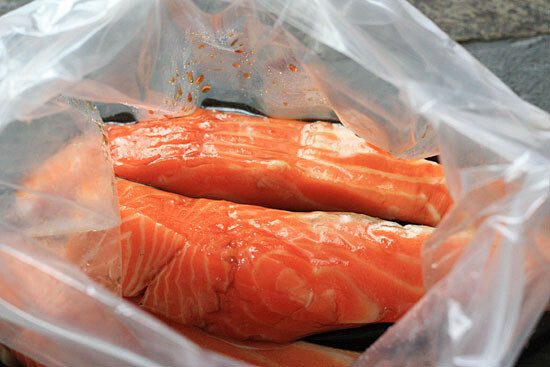 Simply fill a resealable bag with the marinade ingredients, add the salmon and marinate until you’re ready to cook. Then when you’re ready to start dinner, make your sides and your fish will be done in less than 15 minutes. 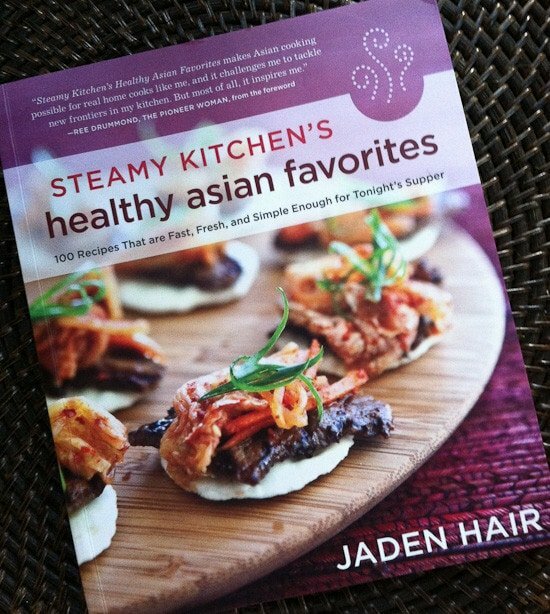 This recipe is from the cookbook Steamy Kitchen’s Healthy Asian Favorites. Filled with beautiful photos and 100 fast, simple Asian recipes anyone can make on a busy weeknight. We all loved this simple dish in my home, it tasted like something I would order in an upscale Asian restaurant, yet it was so simple to make. I served this with forbidden rice and sauteed sugar snap peas on the side, but this would also be wonderful with edamame fried rice. Adding salmon to your plate is one of the healthiest decisions you can make. Studies link its high concentration of omega-3 fatty acids and other nutrients with a lower risk of heart disease, heart attack, stroke, cancer, Alzheimer’s disease and more. By choosing fresh wild salmon (your best bet is wild Alaskan or Pacific) over farmed, you will likely be getting better quality, less-contaminated fish. However, the health benefits of eating farmed salmon far outweigh the health risks associated with not eating salmon at all; so if wild salmon is out of your budget, go for the farmed variety. 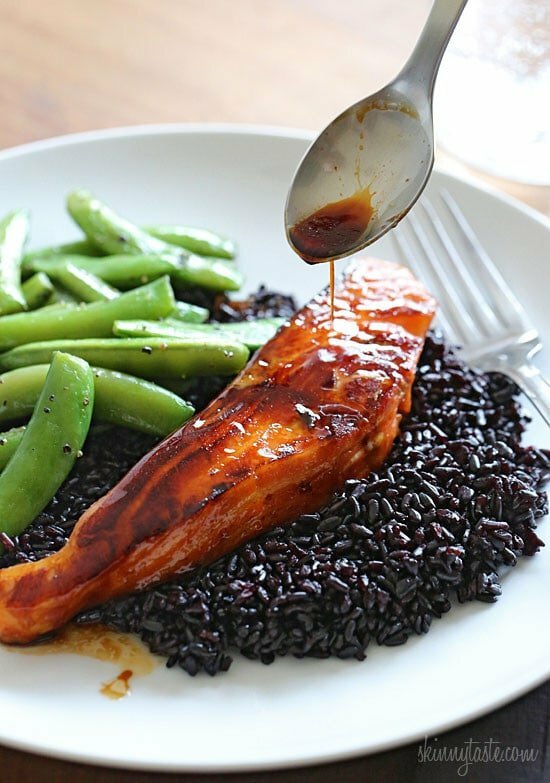 Honey-Teriyaki Salmon with an Asian honey glaze is such and easy, flavorful dish you can make any night of the week. Simply fill a resealable bag with the marinade ingredients, add the salmon and marinate until you’re ready to cook. Remove salmon, reserving the marinade. Heat a frying pan or sauté pan over medium-high heat. When hot, swirl in the oil. Sear salmon, 2 minutes per side. Turn heat to low and pour in the reserved marinade. Cover and cook for 4 to 5 minutes, until cooked through. Nutritional information for wild salmon provided by Heather K Jones, RD. This salmon was wonderful! As suggested, I used 1/4 c. white wine and 1/4 t. brown sugar for the sake. I also made some black rice from Costco that I had in the freezer. I slightly toasted the rice in 2 T butter with 1/4 c. diced onion for 6 minutes, then added water with a chicken bouillon cube for 25 minutes and then let rest for 10 minutes. I served it sprinkled with toasted almond slivers and sprinkled some black truffle salt on my portion as the family is not as fond of it as I. am. What can I use instead of sake and mirin, I don’t have either one? It looks amazing and I can’t wait to try it!! Thanks!! You can use dry sherry or sweet marsala. How would I prepare this with frozen salmon? And I was also wondering if it can be cooked in the oven? Thanks! I make it with frozen wild alaskan salmon, just defrost the fish and follow recipe!. Its so quick in a skillet, takes all of 8-10 minutes. I would not do in oven. Can this be cooked in the oven? If so, what temperature and how long? Hi Gina! I have tried to make this a few times and I always find that 2 minutes on each side and 5 minutes covered is not nearly enough to cook through. Am I doing something wrong? Thanks! I just made this for dinner last night minus the sake and it still came out wonderful! i've tried other recipes but this one is by far the best! thanks a lot! 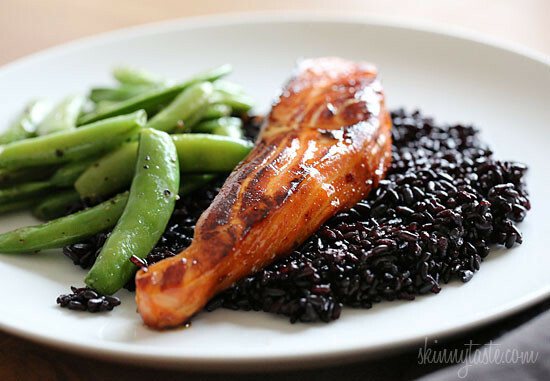 Just made this for dinner, including the black rice and sugar snap peas. It was great! Such a beautiful presentation! Thanks for another great meal! Have you thought about adapting this for chicken? I made an attempt and it didn't turn out terrific but I think it can be done well…I'm just not sure how. I am going to use the white wine because I do not have sake, should I double it to replace both the mirin and the sake? 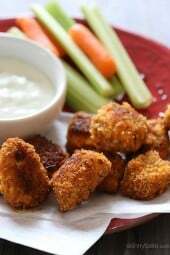 So easy, so yummy, and my whole family loved it! I only marinated the salmon for an hour and didn't use sake, but it had so much flavor. Will definitely make again! Wow was this ever delicious. Didn't use sake. Added cloves of garlic and some ginger to the marinade, left it for about 8 hours. Great, great recipe, will definitely make again! This was great! Had it tonight and my kids loved it as much as I did. Thank you! Gina, if I do not have sake should I just leave it out or double the Mirin amount to make up for it? Thank you! Ok we aren't fans of salmon. We've tried it before and thought it was the way we cooked it. This marinade would be good I think maybe on shrimp or some other fish that we do like, like tilapia. I wish we liked salmon cause it's so good for you!! This salmon was absolutely wonderful! I made this dish for my picky teen and she said it was delicious. 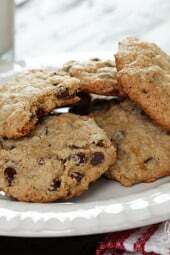 Thank you for sharing such an awesome recipe. This will now become a staple in our household! The Salmon dish looks divine! I'm using the frozen, wild to costly for me. Am putting it over brown rice. Hope tastes good that way. Thanks for recipe! Salmon is amazingly delicious. Love this prep idea. I’ve used a maple glaze, but not honey. I like it! Gina – this salmon is excellent! My husband even commented on it the next day. This one will be going in the rotation. Thank you for your site – its my go to! Gina – the salmon I have has skin on one side. How will this affect the cooking etc?? Can I still do this recipe? Thanks so much, love your site!!! This was really good. I couldn't find the sake at the grocery store, so I just left it out, and it lowered the points!!! I will be making this again! And, I also made the edamame fried rice too – thanks so much, Gina!!! Hi Gina, I couldn't find Mirin at my local supermarket, but I have researched that 1/4 tsp of brown sugar in a 1/4 cup of white wine is a good substitute. Do you recommend pinot grigio for the white wine? Also, since I don't have Sake, do you think I can add extra mirin substitue to make up for not inlcuding the sake? Did you get an answer or did you make it and if so how did it.turn out? I don't have sake or mirin. Was planning on leaving the sake out and using wine wine and sugar for the.Mirin. Should I double the.Mirin substitute to make up for the missing sake? Did you use regular or brown sugar?? I cant eat soy – i know this is a major ingredient, but wondering if you know something I could sub for it? Liquid aminos is a natural soy sauce substitute. U can find it at GNC. OMG this was a HUGE hit with my toddler!!!! I substituted the sake for brown sugar (what I had on hand). He loved it so much, he would not stop eating and asked me this weekend for more pink fish. I also made this with chicken and it was wonderful! The book recipe looks awesome and the food looks amazing! Thank you for sharing this. I really enjoyed this, and I'm not a great fish eater. I didn't have any sake, is the points value lower? Making this for dinner tonight for two very picky mexican men. I am sure i'm going to charm their pants off, thanks to you Gina!!! Oh, do you have any reciepes with sriracha as an ingredient? Thats right up their ally! I have a bunch, make the Bangin Good Shrimp!! I am making this tonight for dinner! I had a hard time finding the Mirin (sweet rice wine) in the liquor section… Finally asked and was pointed to the cooking section as it's a cooking wine.. Nice tip to add to the recipe so other wine novices like myself will know where to go :-)..I am making it with regular wine though, as I didn't want to spend $10 for the Mirin…haha… can't wait for dinner tonight. Thanks again for yet another great recipe, Gina! This looks amazing!! I can't wait to cook it for dinner tonight! How do you cook the forbidden rice? Black rice is rich in fiber, vitamin E and antioxidants. Salmon is a brain healthy food. When both these are combined as a recipe it will provide a highly nutritious diet. Thanks for the great recipe. I would also like to know where to buy the black rice. Is it available anywhere or is it a special recipe? 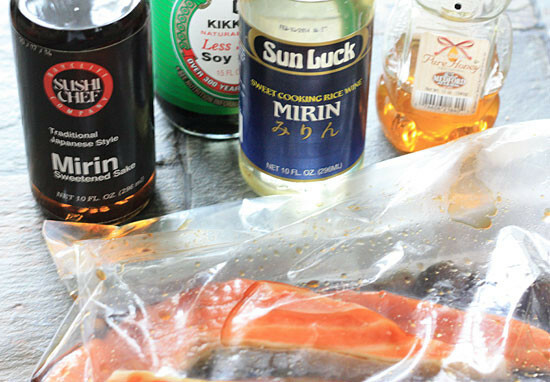 I was going to make this recipe tonight but after searching at the grocery store I wasn't able to find MIRIN…any ideas on how to sub it and the sake?? thanks Gina. Please fix the printer friendly version code. I try to delete the extraneous text (description) at the top/beginning of the recipe and it deletes the ENTIRE recipe. I have tried this three times and the whole recipe is deleted. Also, in the top paragraph, I have to delete every single word for some reason that is linked or in blue. Please fix?! Gina, can I find the forbidden rice in any typical grocery store? Looks good! My Husband the Fisherman, will not eat fish, unless it's beer battered and fried! Crazy! I love salmon and your whole meal looks amazing!! I've never heard of forbidden rice before…sounds very interesting! Love your pics, by the way. 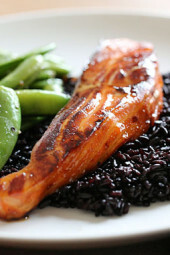 Black rice is also great cooked/mixed with jasmine rice. It is so fragrant and gives a pretty purple color! love that idea, I'll have to try it. If there's one food that makes my heart sing, it's salmon!! Beautiful photos Gina. I think I need to get my hands on Jaden's book. I never get tired of Asian food! That rice goes great with this recipe! Looks so good! This is definitely going on my meal plan. How about wild salmon that is frozen and packaged? It is much cheaper, but would it be better than fresh farmed-raised? Sure, I often buy frozen wild Alaskan salmon. Sure, if you leave it out I'm sure it would still taste great. Gina I had the same question. What could I substitute the sake with or should I just leave it out? Also, I have never prepared sugar peas. Could you please tell me did you cook them? I sauteed them in a little oil and garlic for about 3 to 4 minutes, until tender crisp. Super easy! And yes, just leave out the sake, will still be great. Thank you Gina your the best! 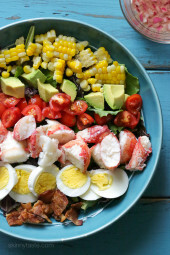 I can't wait to make this tonight! It looks so good! Looks WONDERFUL! I have black rice in there that I keep forgetting about. Now I'm hungry for fish! Chicken might be taking a back seat tonight. We had this rice with calamari when we went out for dinner in Minneapolis. Not a fish eater, would it be good on chicken? Can find those ingredients in the groery store? Regular wine would work fine in it's place. I'm sure this would taste great over chicken too. I'm sure this would be great with any fish. It's an Asian black rice. It's wonderful, sticky and has a nice flavor. I've never tried that kind of rice before, but now I definitely will! 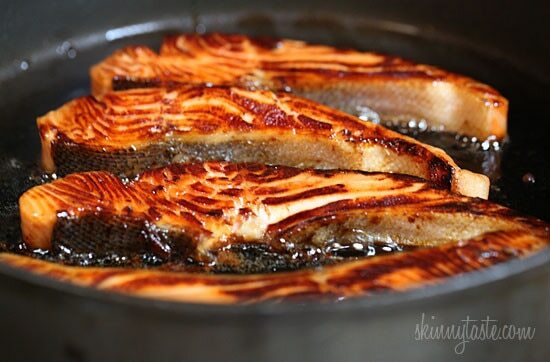 Salmon is such a flavourful dish, I can't wait to try this delicious recipe! where do you buy the forbidden rice? It looks really interesting… is it nutritionally different than regular rice? They sell it at Costco and also at Whole Foods. It's much cheaper at Costco — so I'd start there if there's one close to you.